How does a French lunatic living in Tokyo’s sewers get back to Paris? Such details hardly matter. What is important is the subterranean freak seen in Léos Carax’s contribution to the anthology film Tokyo! is actually one of many personas adopted by Monsieur Oscar. The mysterious performer will travel through Paris for a series of “appointments” that blur the distinction between performance and reality in Carax’s genre-defying Holy Motors (trailer here), which opens this Wednesday at Film Forum, after generating all kinds of critical acclaim and confusion at the recently wrapped 50th New York Film Festival. Monsieur Oscar starts his day as a wealthy family man, but after his chauffeur Céline picks him up, he transforms himself into an old beggar woman in the backseat of the limousine. At his next appointment, he becomes a high tech martial artist for a mo-cap animation production. After that, Monsieur Oscar heads into the sewers, once again becoming the notorious Merde, who will kidnap a fashion model to recreate the Pieta, by way of King Kong. As the day progresses, Monsieur Oscar will confront his doppelganger, reunite with a former lover, and die twice, but the show always goes on. We are given clues that there is indeed an audience for his work, by no less an authority than Michel Piccolli (appearing as a character simply known “The Man with the Birthmark”), but questions like who and how are never answered. Allusions fly fast and furious while the appointments become increasingly emotional, subversively inviting viewers to invest in episodes they have been conditioned to be skeptical of. Perhaps the most impressive aspect of Motors is its kitchen sink-ness. One gets the impression that everything Carax dreamed up for the film made its way into the final cut. As trippy and mind-bending as it all might be, Carax maintains a profound sense of melancholy that stays with viewers far longer than his surreal eccentricities. Especially cinematic is an episode played atop a shuttered Parisian department store that still bears hints of its former grandeur. In fact, several appointments would stand alone perfectly well as short films, which is an important test for such an episodic film. Gamesmanship of every sort is afoot in Motors, which will confound or delight, depending on one’s temperament. Even Monsieur Oscar seems to be a bit of self-referential tomfoolery, considering Carax’s professional moniker is an anagram of Alex Oscar, as he was once known. Regardless of his trippier flourishes, Motors is one of the most seductive and idiosyncratic excursions into “Paris by night” captured on film. 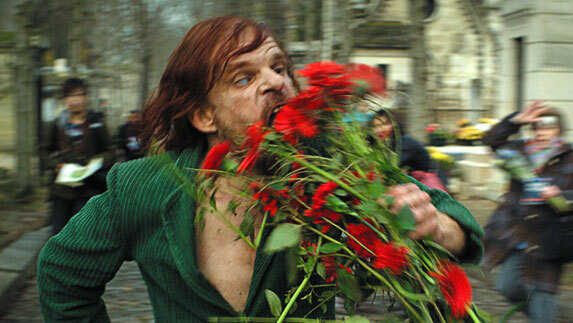 Wholly original and insidiously moody, Holy Motors is an absolute can’t miss for fans of cult cinema. Recommended accordingly, it opens this Wednesday (10/17) at New York’s Film Forum.